You are here: Home / Home / Appliances / Choosing A Washing Machine – Which Bosch Is Best? Choosing A Washing Machine – Which Bosch Is Best? Buying a new washing machine can be a hefty investment. Machines aren’t as expensive as they used to be, but you’re still going to be dropping a big chunk of change on a washer and will want to make a good decision. Going with a big brand name machine can be a good idea, you tend to get reliability and know that you’re getting a good product. Bosch has an excellent reputation as a household electronics manufacturer, and their machines are good quality and come at fair prices. But even if you decide to go with a Bosch, you still have a decision to make as to which model you want to buy. The two leading models of traditional washer that Bosch makes are the WAQ28461GB and the WAE24368GB. These machines do differ slightly in price, but what are their other comparative points? Read on to find out how these machines compare, and which one makes a better buy for you. 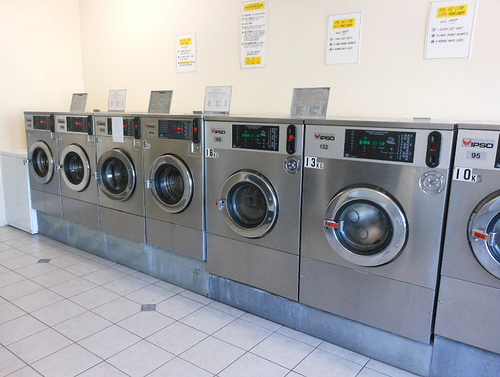 A deciding point for many people is the size of a machine, most people have a designated space in which to put a washer and are therefore limited in terms of dimensions. In this case, both machines are around 85 cm high and 60 cm wide, but the WAQ is shallower at 55 cm deep, whereas the WAE is 59 cm deep. The capacity of a washing machine is how much clothing you can put in per wash. In the case of the WAQ that’s eight kilos, as opposed to the WAE that can handle only seven kilos. In general, a bigger capacity is better as it means that you can do more laundry at a time and therefore run the machine less often. Efficiency is an important consideration when buying any electrical appliance. It’s not just the initial cost that should be part of your decision, but also the running cost of the machine itself. A better energy rating means that a machine uses less electricity to run, and is therefore cheaper in the long run. The WAQ gets an A+++ rating, whereas the WAE gets only an A++ rating. In real terms, the WAQ uses 179 Kwh of energy annually to run, and the WAE uses 197 Kwh, making the WAQ cheaper to run. Not only that, but the WAQ has a 1400 rpm spin cycle, the WAE has only a 1200 rpm cycle, meaning that the WAQ is more powerful and can run shorter cycles which will also save money. Unsurprisingly, the WAQ comes in more expensive than the WAE, but not by much, only by around £100. Which is the Better Bargain? The WAQ has to be the better buy. Yes, it’s more expensive initially, but you’re going to end up saving money because of the WAQ’s better energy rating. Over time, the WAQ will more than make up for the difference in price. Plus, with a bigger capacity you’ll be able to run the WAQ less often than you’ll have to run the WAE to do the same amount of laundry, so you’ll save money there too. Sometimes it’s worth paying a little extra at the beginning to save money over time. Phil Turner thinks that fuel comparison sites are great, but that careful selection of replacement appliances can do much more to cut his bills than just switching suppliers.